The resorts has 14 suites with panoramic views of the coast or the surrounding hillside, and 373 deluxe rooms. The rooms are design with the same elegance of the Shangri-La brand hotels, but with the family in mind. Some rooms come with a Murphy Bed, which can be pull-down and retracted back into the wall to accommodate an extra person in the room. 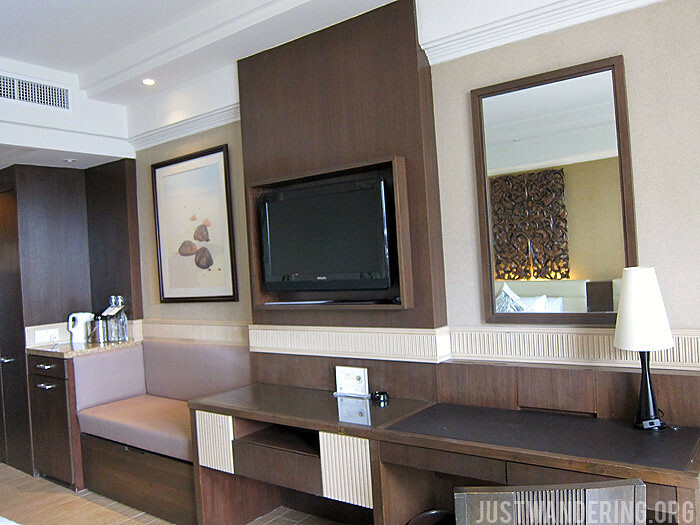 All the rooms come with the standard features: LCD television, DVD player, satellite television channels, USB, iPod and modem ports in an audiovisual panel, coffee and tea making facilities, and of course, complimentary Wi-Fi. 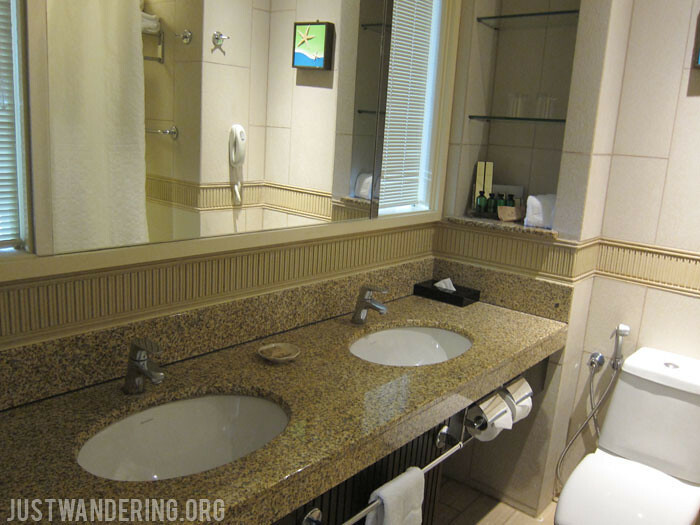 The bathroom has the shower in tub configuration, and comes with two sinks, so if one kid is hogging one, there’s another you can use. Like Shangri-La’s Rasa Sentosa Resort, many of the guests staying at Golden Sands (and Rasa Sayang) are regulars, and stay for an extended periods of time. 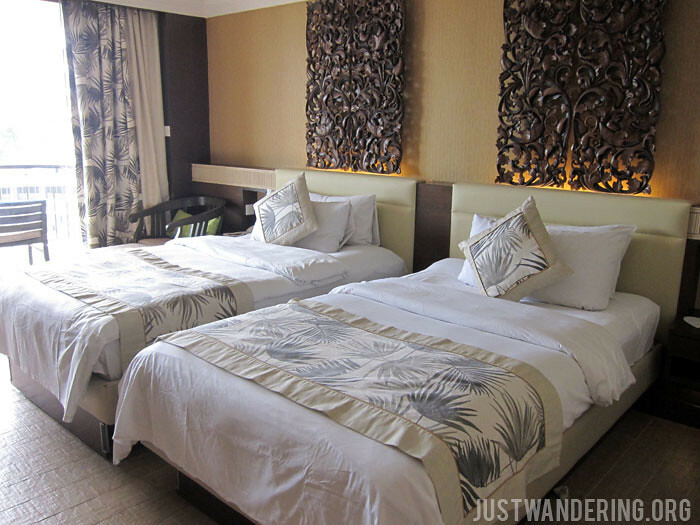 Golden Sands Resort is one of those places that you don’t stay in just to sleep. The resort tries to anticipate their guest’s needs and offer them within the property — there are tailors, hair salons, and even laundry facilites for long staying guests. Aside from the lagoon pool, there are also pool and futsal tables near Sigi’s bar, two pétanque courts, tennis courts, beach soccer court, Par 3 Pitch and Putt Gold Course, kid’s sand patch, and a beach volleyball court. Guests who arrive early or need to kill time after check-out before heading to the airport can hang out at the Cool Lounge, where they can play board and card games, surf the Internet, read books, magazines, and newspapers, and watch movies. 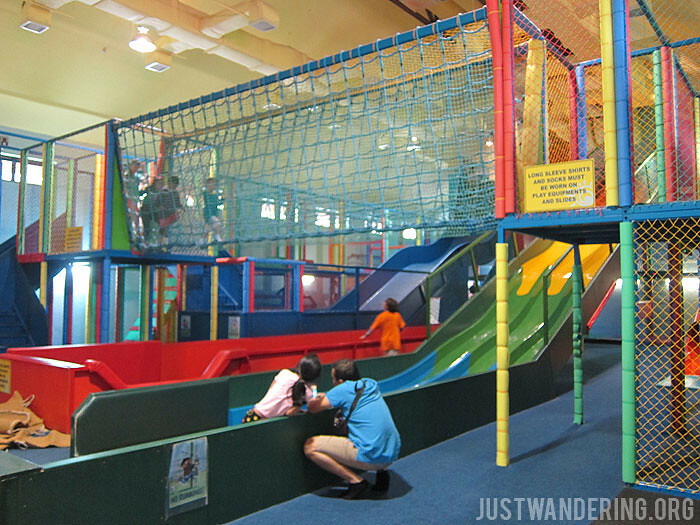 The Adventure Zone Family Entertainment Centre is a huge indoor playground spanning more than 10,000 square feet. 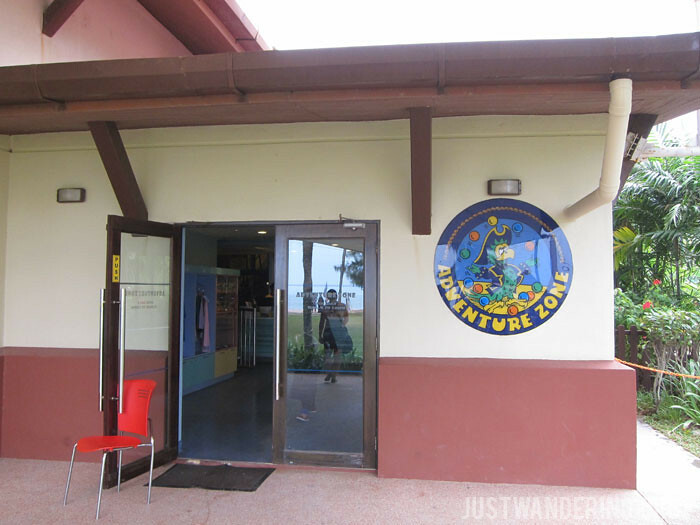 The center has three zones for different age groups, including toddler-safe play area for kids four years and under, thrilling slides for older kids, and game consoles for teenagers and adults. Parents who need some alone time can also arrange for a baby sitter to watch their kids while they relax. Sigi’s is located right at the edge of the garden and the beach, and is a lovely place to watch the sun set over the Andaman Sea. They offer a variety of continental dishes and drinks that can be enjoyed inside the restaurant, by the pool, or on the beach. 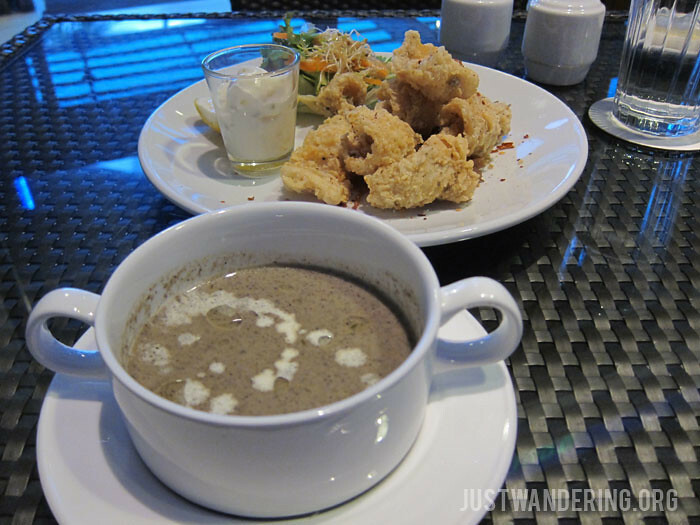 We started our dinner with Wild Mushroom Soup and Calamari Fritti. Not wanting to fill up too much, we asked to split the soup. It was hearty and creamy, and the truffle oil brings it to another level without overpowering the flavor of the mushroom. The calamari was crunchy breading on the outside, tender on the inside, just the way it’s supposed to be. Since we were by the sea, we had to order the Grilled Seafood Platter. This is Sigi’s signature dish, and they are right to be proud of it! 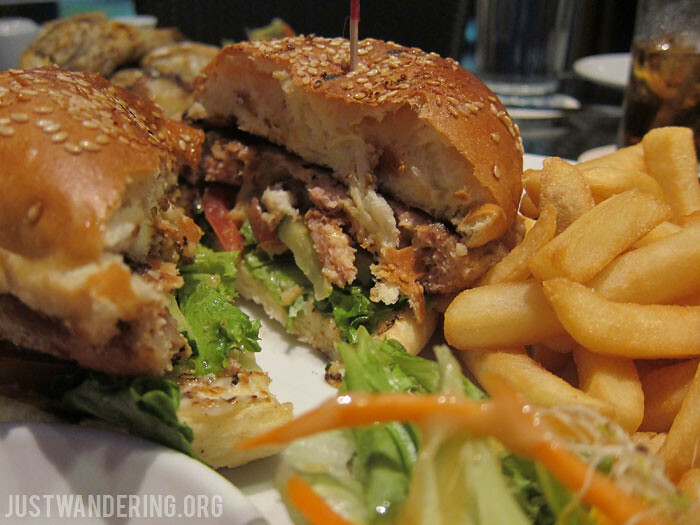 Each piece we bit into was juicy and tender, and the individual flavors coming out perfectly. The highlight of the meal though, was the Durian Cheese Chicken Burger. While Cla and I were not bid durian fans, we were intrigued when Suleiman told us about it over breakfast at the Ferringhi Grill. July and August is the peak month for durian harvest in Penang, so it is the perfect time to offer this unique burger. The durian is cooked into a savory custard and added into the cheese to make this amazing cheese melt. Paired with the grilled chicken burger, this is the match made in heaven. 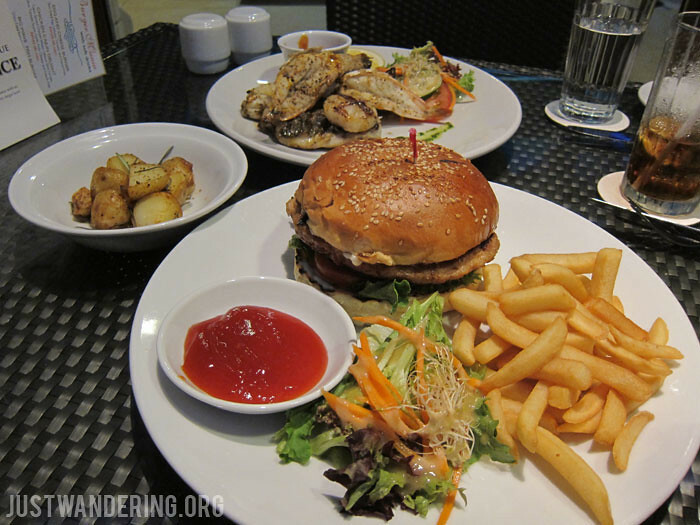 This burger costs RM 45 (inclusive of taxes), and is only available until the end of August 2015. Golden Sands Resort by Shangri-La is offering a RM 660++ Family Fun Package for two adults and two children. This rate includes daily buffet breakfast at the Garden Cafe, complimentary bed for one child under 12 years old, daily dinner with free-flowing drinks at the Garden Cafe, and four-hour complimentary access to the Adventure Zone for two kids. Children from 5-12 years old can also join the Cool Zone Kid’s Club fun activities from 9:30 am to 9 pm. For more details, visit the resort’s website. 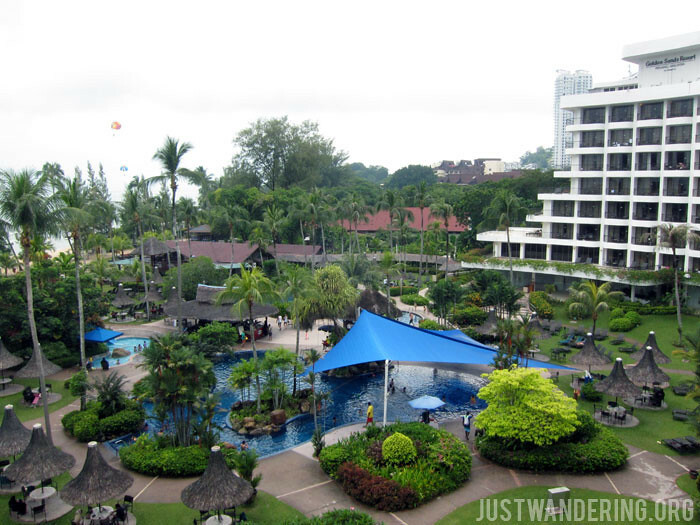 Thank you once again to Shangri-La Hotels & Resorts for accommodating us in Penang! We went to Malaysia for a family travel last year. As usual, we brought with as our anti jet lag buddy, jetLAGFX http://www.jetlagfx.com/. We had a great stay in Golden Sands Resort. Best ever! I even recommend this to my friends.